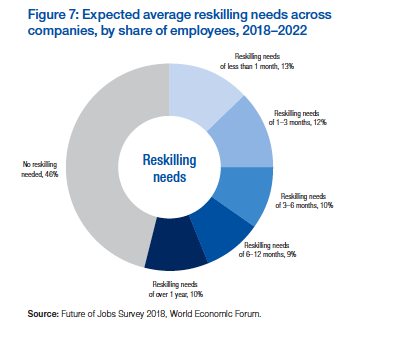 The World Economic Forum’s new research paper talks about the future of jobs and the new skills that people will require to stay relevant. The World Economic Forum has come out with a study ‘The Future of Jobs 2018’ which talks about technology becoming the most integral part of business. It discusses the new kinds of roles which may come up or will be in demand between 2018 and 2022, also revealing that people will need some specialised skills to fit into these roles. Some capabilities or skills will definitely be more sought after in the next few years. While technology has already become an integral part of businesses today, the biggest challenge for the people is to learn the functioning of these technologies in order to survive in the business and the market. According to the study, high-speed mobile internet, artificial intelligence, adoption of big data analytics and cloud systems will become the strategic drivers of the business model between 2018 and 2022. The results of the study suggest that 16 per cent new roles and 31 per cent redundant roles existed in 2018. As the world moves towards 2022 the numbers will change. 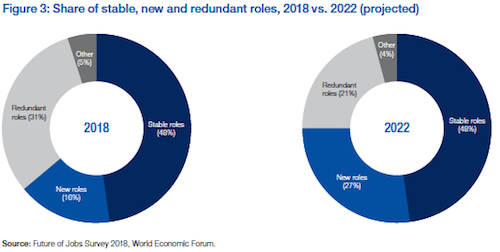 The percentage of redundant roles will reduce to 21 per cent while new roles will increase to 27 per cent. It is clear that some of the redundant roles will be automated by technology and machines, and in their place new roles will be generated. 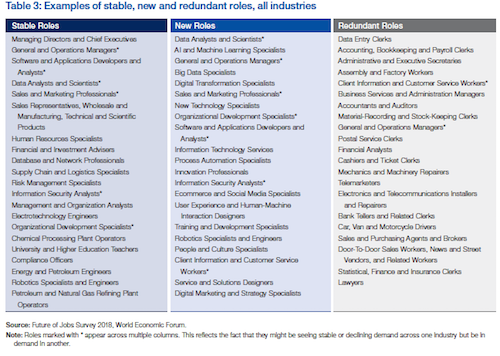 Some of the new roles which will prevail will be in the areas of AI and machine learning analytics, big data analytics, robotics and engineering. 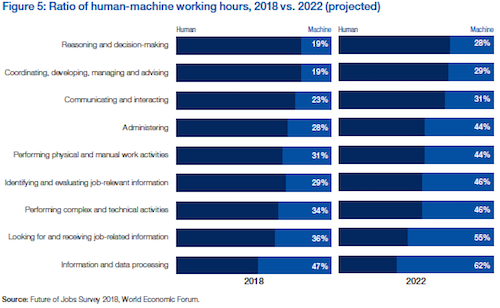 The study also gives a comparison between the working hours of machines and humans in 2018 and 2022 in different functions. It is very evident that machines will reduce the working hours of humans in the coming years. The study reveals that in information and data processing, where machines contribute 47 per cent now, the contribution will increase to 62 per cent. When it comes to technical and complex jobs, the working hours of machines will increase from 34 per cent in 2018 to 46 per cent in 2022. Interestingly, the most trending and ‘in demand’ skills in 2022 will be of analytical thinking and innovation, active learning and learning strategies, technology design and programming and many more. The biggest concern in the future will be reskilling of employees. 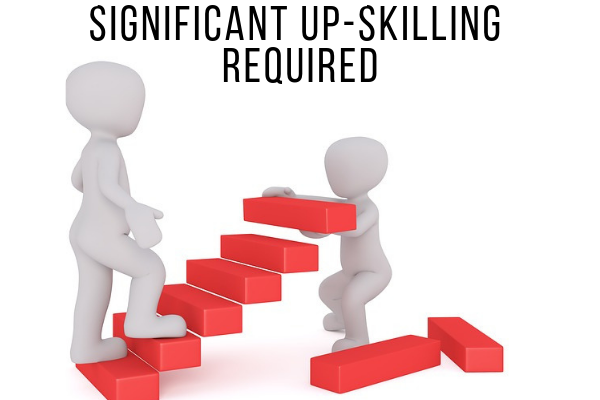 The research says that at least 54 per cent of all employees will require significant reskilling and upskilling. About 35 per cent of these are expected to need additional training of up to six months, while nine per cent will require reskilling of six to 12 months. Ten per cent will have to be trained on additional skills for over a year. The region wise study also reveals that the emerging job roles in India will be that of managing directors and chief executives, sales representatives for technical and scientific products, software and applications developers and data scientists, financial analysts, human resource specialists, and financial and investment advisers among others. 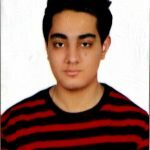 Some of the emerging skills in India will include analytical thinking and innovation, active learning, creativity, originality and initiative, technology design and programming, critical thinking and analysis, complex problem-solving, leadership and social influence, reasoning, problem-solving and ideation, emotional intelligence, systems analysis and evaluation. While the future workforce will definitely be expected to be proficient in new technologies between the present and 2022, ‘human’ skills such as creativity, persuasion and negotiation will not lose their value. In fact, attention to detail, resilience, flexibility and complex problem-solving will be qualities that will only become more valuable. Emotional intelligence, leadership and social influence as well as service orientation will also witness dramatic increase in demand as compared to their present standing.